Statutory audit is a mandatory requirement. The Hong Kong Companies Ordinance requires a company to carry out an audit annually and directors are to present the audited financial statements to the shareholders at general meetings. Audited financial statements are also required to support corporate tax returns under the Inland Revenue Ordinance. However, one must look beyond these compliance requirements in order to fully appreciate the benefits of an audit. An audit is carried out by an independent auditor, performing procedures planned and conducted in accordance with the Hong Kong Standards on Auditing ("HKSA") which correspond to the International Standards on Auditing ("ISA"). Its objective is to provide reasonable assurance about whether the financial statements prepared by the management are free from material misstatements. The procedures selected depend on the auditor's assessment of the risks of material misstatement of the financial statements in the light of understanding obtained in respect of the company and its operating environment including internal control. While the auditor's internal control review is not for the purpose of expressing an opinion on the effectiveness of the internal controls, some observations may nevertheless help the company form useful insights for removing deficiencies thus building a robust and efficient business. Accordingly, it is useful for a company to establish appropriate communication protocol with its auditor to share insights derived from observations made in the course of an audit. Both the ISA and HKSA promote effective two-way communication between auditors and clients. The principal requirements are set out in two auditing standards, ISA / HKSA 260 and 265. The former requires auditors to communicate with those responsible for overseeing the companies' strategic direction and accountability ("the Governance") in matters concerning the responsibilities of the auditor, the planned scope and timing of the audit and significant findings from the audit. The latter requires auditors to also communicate with those responsible for managing the companies' operation ("the Management") in matters concerning deficiencies in internal control. One should carefully read the audit engagement letter which typically sets out responsibilities of the auditor and the approach to audit. 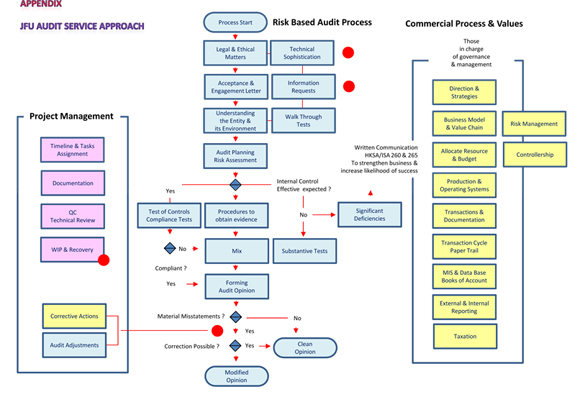 Appendix is a flowchart which depicts a standard audit approach and how it relates to the commercial process. The flowchart shows that an audit requires the auditor to communicate with the client to obtain a good understanding of the company, and its operating environment including internal control. Internal control is the system that provides reasonable assurance about the achievement of the company's objectives with regard to reporting, operation and legal compliance. On the basis of the understanding thus obtained, the auditor anticipates if the company has effective controls to prevent, detect and correct misstatement in its accounts on a timely basis. The auditor then plans and conducts the audit accordingly, carrying out effective procedures to obtain evidence and form the audit opinion. Audit provides reasonable assurance on the quality of information one may obtain from reading a company's financial statements. In addition, a well structured two-way communication as mentioned above can facilitate the sharing of insights derived from the audit process and analysis of the business for audit purposes. The flowchart shows how we view and analyze the commercial process of a business for the purpose of enabling us to plan and conduct the audit. Our examination of the internal control system is more concerned with whether it can effectively prevent, detect or correct misstatements in the financial statements. However, the insights obtained may also help the Governance and the Management to avoid misdirection and to build a more robust and sturdy business. The auditing standards anticipate practical constraints that smaller companies may encounter and direct that auditors may have to communicate with the Governance and the Management in a less structured manner. This direction is given with special consideration to less resourceful companies whose budget or manpower is more restricted. Auditors and clients should discuss the scope and format of audit communication and how insights can be shared in the interest of the business.